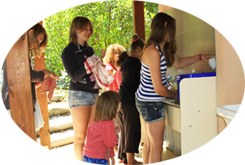 For your holidays in the Hautes-Alpes and for nature lovers, Camping La Palatrière offers 50 pitches in the mountains facing the Serre-Ponçon lake and the doors of the Ecrins National Park. For your stay in tent or caravan, you will have a choice of various sites and delimited and equipped with electric terminals. For more comfort 2 sanitary blocks are at your disposal nearby as well as arranged barbecue corners. Use of hot water facilities, access to the swimming pool and spa and participation in games and entertainment are included in the price of your stay. Booking your location is posible from 4 nights and is highly recommended for the months of July and August. Sanitary hot water, heated swimming pool and paddling pool, spa, sunbathing, playground for children, pétanque field, freezer for refrigerated tanks. Snack bar, pizzeria and bread deposit in season.